Possibly the most common British carabid, abundant across England, Wales and Scotland although records are more scattered in the far north. Found in various habitats throughout the Watford area; we have recorded adults under logs and loose bark and among leaf litter in all the local woods, on parkland pathways, shrub beds and in both tended and untended grassland, arable farmland, domestic gardens throughout our area and even among wet reed litter near Radlett road. Pitfall traps in just about any situation will produce them e.g. they occurred regularly in several traps placed around municipal carparks in the town centre. Populations vary widely from year to year, during 2006 they were abundant everywhere while 2007 saw very reduced numbers. 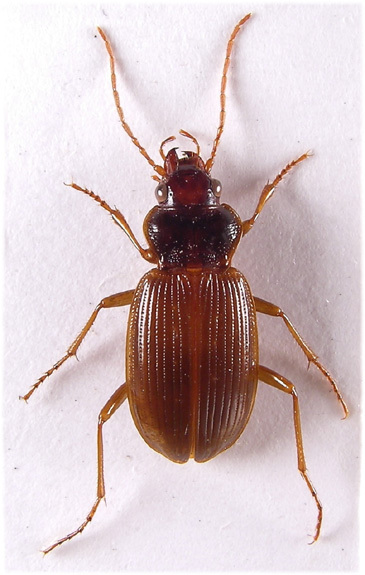 Found in small numbers during the winter, mostly under debris or bark but occasionally from grass tussocks and leaf litter samples. 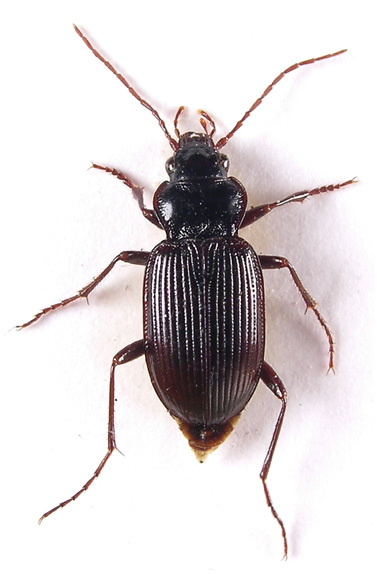 They generally become conspicuous from April to May when they may be observed running nocturnally on open ground or in gardens, usually in company with other carabids e.g. 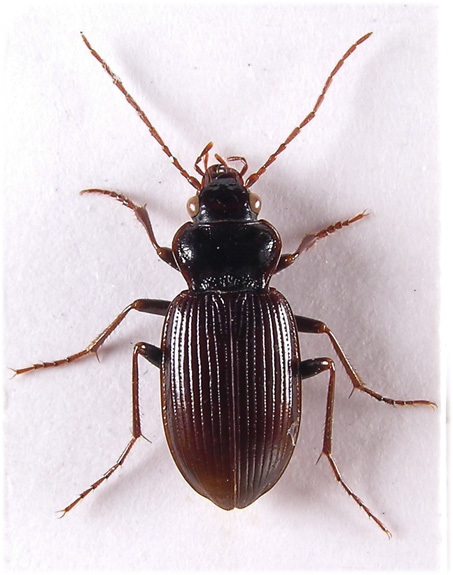 Calathus fuscipes Goeze, Pterostichus madidus (Fab.) 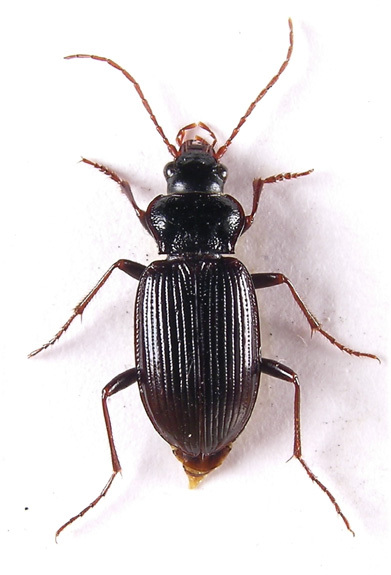 or Harpalus affinis (Schrank) Any warm night from the beginning of June will provide the opportunity to observe them, in 'good' years they will be found every few metres along the kilometres of pathways around Cassiobury park and, although not a riparian species, along river margins and among reed beds. They remain conspicuous until a diapause in early or mid August, although during 2006 at least some adults were observed every week during July, August and September, following this they are active again but numbers are now reduced both in the open and in pitfall traps, now brevicollis is active (at least in Cassibury park) among huge populations of Ocypus olens, each species seemingly ignoring the other. They breed following the diapause and larvae overwinter in the soil, becoming active on the surface during mild spells (Luff). 10-14mm. Glabrous, uniformly dark when mature, lighter immature specimens are found throughout the summer. Antennae light brown, pubescent from fourth segment. Palpi brown, as antennae and of 'normal' length, mandibles normal (cf. Leistus). Head with a single setiferous puncture on inside margin of eyes. Pronotum broad and short, strongly rounded and cordate, once familiar this will instantly identify Nebria spp. With setae at hind angles and laterally in front of middle, punctate across base and inside raised side borders, sparsely so behind front margins, front angles produced. Each elytron with eight well impressed and punctate striae, third stria with 3-6 larger, somewhat foveate punctures, with transverse microsculpture closely inside at X50 (cf N.salina Fairmaire). Extreme edges of pronotum and elytra sometimes translucent. Legs long, femora darker than tibiae, each segment of meso and meta tarsi with several (basal segment up to 10) pairs of fine setae or pores (N.salina). In several works this difference is described as simply 'pubescent' for brevicollis and glabrous for salina. We do not have a specimen of salina but, assuming the metatarsi in this species to be 'glabrous', the difference is straightforward; the description 'pubescent' may be misleading as this is usually taken to mean a surface clothed in fine setae or hairs, in brevicollis, at least in the many specimens we have examined these hairs are arranged in discrete transverse (or nearly transverse) pairs along the dorsal surface of the tarsal segments, the cuticle in between these pairs being glabrous (look carefully; at least X50 with good lighting). Claws smooth.